So i was looking to redo the gear for my monk brewmaster for the few MM+ i’m going to do later today. I said to myself “hey we are going to do 12-13 ich, so i could go a bit more offensive”. 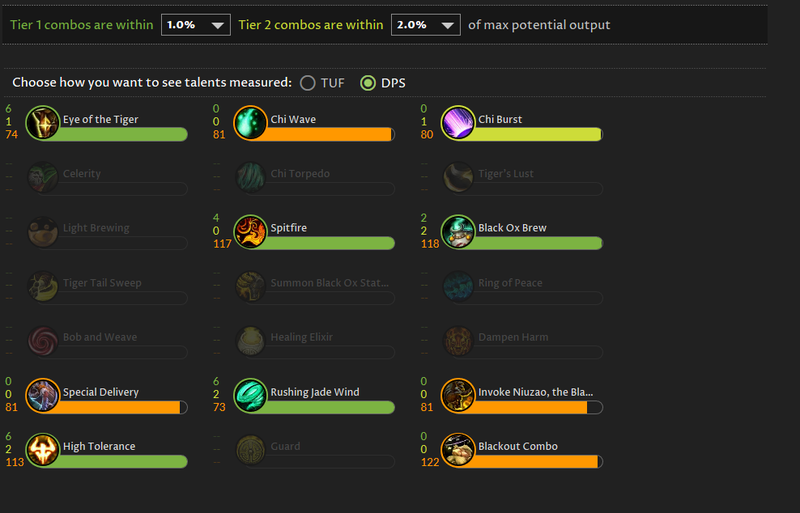 Hum ok so if i want to push a bit DPS i could go Eye of the tiger, Spitfire, Rushing Jade Wind, High Tolerance. Let’s do a BiB for it ! okay what about my old setup ? So we have a talent stated as “one of the best talent (1%) in the guide” (i guess for the same difficulty content, for the same gear iLvl etc…). That seems to be a downgrade from one gear to the other. Maybe talent guide for tanks need a difficulty setting as well ? I dont clearly understand what happen i may be on an edge case here. I can’t reach TUF level ? I feel like it’s a bit weird i dont know why or how to explain it but i dont think “light brewing” is that powerfull for iron skin brew but i may be wrong. Could i get your point of view ? This seems to be an issue with the weapon. You have that 425 Deathspeaker Spire in your bag that has no agility on it, and the optimizer is wanting to pick it for some reason. I’ll have to ask yellow what’s up with that. Can you post your export string from the addon so i we can try to recreate this? Yeah it looks like you’re right on an edge between toughness/damage… if you lower the setting to like mythic 10, it picks the gear you are probably looking for. This would be a hard one to “fix” since it’s a really fuzzy/hard problem to switch between damage/toughness settings. Yeah <3 Well thanks for looking into it !